Lovelies, remember when I introduced you to Caroline of Coco Draws? And remember I said that there would be a giveaway coming up soon? Well here it is. The lovely and talented Caroline is offering one of you darling readers the above 8x10 print: Addicted to Flats. I have to say I love everything in her Etsy shop, don't you? I think this print would look gorgeous in my bedroom, in my office, in my bathroom, just about anywhere. Bonus: she is also offering readers of The Short and The Sweet of It a 15% discount on her drawings, just enter shortandsweet15 as the code. This will last until October 18, so act now my lovelies and get ready to fill your house with her adorable little drawings! 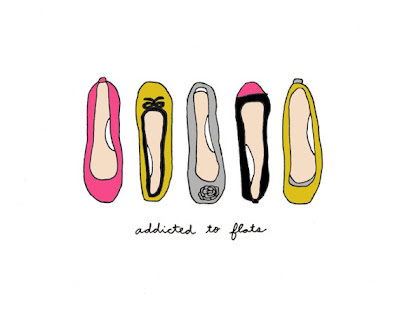 In order to win Addicted to Flats, make sure that you are a follower of The Short and the Sweet of It and visit Caroline's shop to tell us which is your favorite drawing. Good luck my darlings, you have until Wednesday at noon! sign me up! I love the Ukulele Sing print! And I follow Coco Draws on FB! hi alexa! ooh ~ such an awesome giveaway! i'm already a follower of your blog!! and please sign me up for either the pink mac lipstick or les macarons!!! fingers crossed, hope i win!!!!!! this is absolutely adorable! Oh i love it! and i follow her blog now too! Super cute! 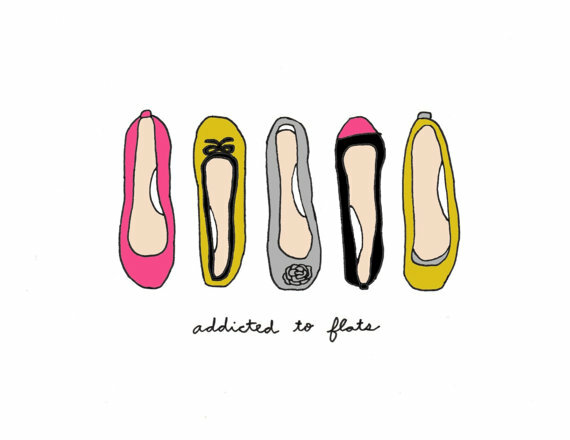 I have sooo many flats. this is adorable, it's my favorite as I know just the place for it! This is such a great giveaway! I am a follower of your blog, and love it! Just visited Coco Draws and I love her drawing of the Red Hunter Boots! Adorable! and I now follow her blog! How dare you make me choose! Ahh, I think Just the Two of Me (bicycle) or any of the rain boots! They are both SO cute! And I follow you guys on Twitter! totally loving the "our love is tandem" prints! cute bikes :) following you girls, of course! I am all over the Hermes scarf! such cute prints. Glad I found you blog. I am officially your newest follower. Apart from the superlicious Addicted To Flats, I like Daisy Marc Jacobs. Thanks for the giveaway. Love the lipstick drawings! so cute! Now this is a fantastic Giveaway! I'm a follower! I love all of them, can't decide on a favorite one! I'm a follower:) The Striped Shirt drawing is just perfection!! 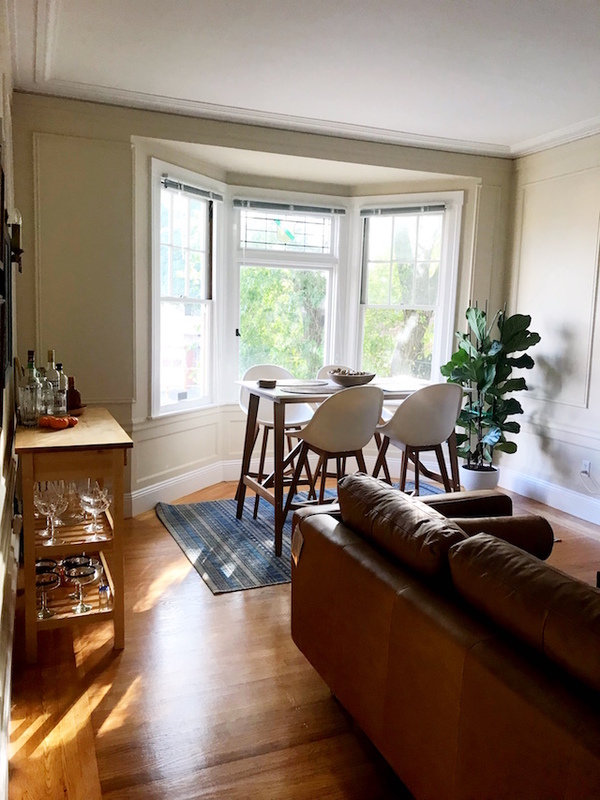 Just started following Caroline's blog too. Love it! A follower of your blog via GFC! Love the Perfect Red illustration!